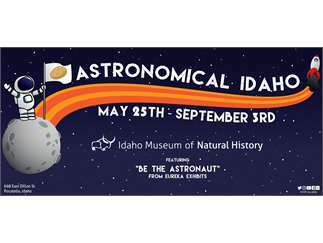 The Idaho Museum of Natural History (IMNH) on Idaho State University’s (ISU) Pocatello campus will explore beyond our atmosphere this summer with Astronomical Idaho featuring Be the Astronaut. Astronomical Idaho, opening May 25th, showcases Idaho’s deep connection with NASA research, space exploration, and the search for life beyond our planet. It includes an immersive digital experience that lets you be the astronaut, travel to distant planets, plan rover missions, and ward off space dangers. Did you know the Craters of the Moon National Monument has served as a training center for space exploration for decades? Did you know ISU faculty are helping to find life outside our planet? Visitors will see a real piece of Mars and learn how to identify meteorites. In addition, Roger Boe, local artist captures Craters of the Moons’ unique landscape through the lens of photography and poetry. The show includes Be the Astronaut from Eureka Exhibits, an engaging interactive exhibit that focuses on space flight. In the exhibit, visitors learn about the challenges and excitement of spaceflight – then apply that knowledge as they fly spaceships, pilot the landers, and drive the rovers, in a thrilling adventure to Earth orbit, the Moon, Mars, and beyond! Astronomical Idaho is sponsored by KIDK Eyewitness News 3, KXPI Fox 5 East Idaho, the Pine Ridge Mall, Idaho State Journal, ON Semiconductor, and Westmark Credit Union.